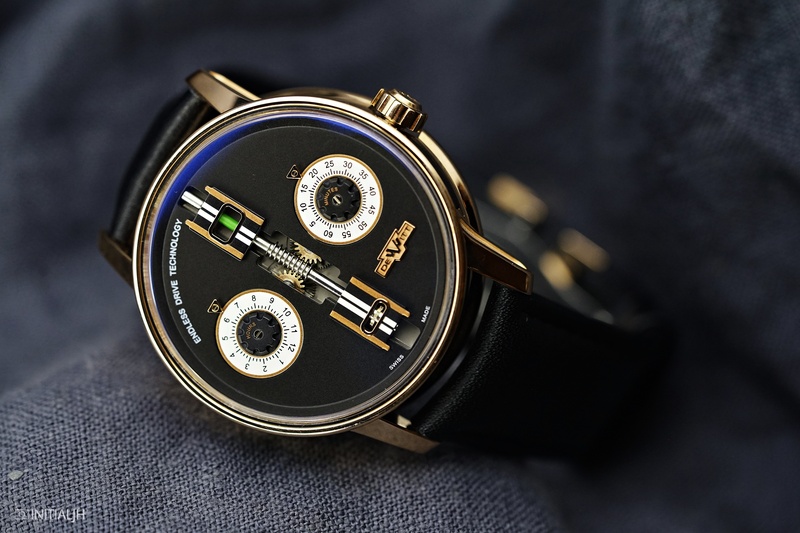 Today, following on from our last post about one of the most interesting watches we’ve seen so far this year, we are looking at another timepiece that we have found eye-catching, although it is for reasons of design, and how something familiar is being depicted in an unfamiliar way. It is impossible not to notice the most striking feature of the Academia Endless Drive by DeWitt. The dial is dominated front and (literally) centre by a rotating ‘endless’ screw. A nod to automotive mechanics (a particular fondness of founder Count Jérôme de Witt, who has a lot of car photos on his phone), the screw is linked to the power reserve’s winding system. As the 59-hour power reserve decreases, the screw rotates to show a red indicator at 12 o’clock. When the barrel is wound, the screw slides on its longitudinal axis and reveals a green indicator in the same spot. For lovers of symmetry, balancing the screw on either side are hours and minutes indicators in the form of two rotating white silvered discs located at 9 o’clock and 3 o’clock respectively. The colour combination of the (DeWitt-made) dial i.e. galvanized black and rose gold, is also reflected in that of the 42.5mm case, which combines rose gold with black rubber on its side. Through the sapphire crystal case back you can see the DeWitt automatic Calibre DW1653, which beats at 21,600VPH. Coming on a black satin calfskin leather strap with a polished 18 carat rose gold triple-folding clasp, the RRP is USD 46,500.